A sermon for the Eighth Sunday after Pentecost, August 3, 2014. The lectionary readings are Isaiah 55:1-5, Psalm 145: 8-9, 15-22, Romans 9:1-5, and Matthew 14:13-21. I don’t know about you, but when I sometimes think about the challenges of following Christ in the twenty-first century, I begin to idealize earlier times. I think about how good those first followers had it. He was there with them. They saw him with their own eyes, and felt him hold their hand or slap them on the back. They could hear his voice and smell the sea on him, like anyone else who had just stepped off a boat after a storm. Empowered by a somewhat Ignatian imagination around scripture, I can get lost in wishing for other, more immediate experiences of Jesus. And then I actually read the Bible and wake up. In passages like today’s, there’s no room for getting lost in an imagined or idealized Christly presence. Jesus, himself, ruins any chance for that. And here’s where Jesus stops being the Jesus of my imagination, the one I think would be so easy to follow if he were still physically here and I could get close to him. Jesus looks at the disciples and says, “They need not go away; you give them something to eat.” YOU give them something to eat. Jesus calls them to look in their pockets. It’s as though Jesus says to them, “You give them something to eat. You’ve got enough. Look around you. Check your pockets. It’s there. I know it is. John’s Gospel names the various disciples and says that it’s Andrew who finds the boy who has the bread and fish from which the miracle is made. The boy probably didn’t think what he had really mattered or amounted to much, but Andrew was able to encourage him. And maybe Andrew didn’t think there was anything to share, until he went around and found the kid. Jesus calls the disciples to dig into their pockets (as it were), but then he invites them to share. The disciples might have kept the food to themselves, or just fed the ones who were really listening to Jesus, or they might have thought up some elaborate scheme of most oppressed to least oppressed, or vice versa. Instead, they gave what they had to Jesus and shared it. To share (to risk being involved, helping, exerting energy, getting dirty). But finally, the key to the success of the day is not in the efforts of the boy who had the fish and the bread. The success is not because of St. Andrew’s willingness, or the other disciples’ ability to coordinate and encourage and spread the good. The real success came through the acknowledgment of the source of the blessing, God. Jesus asked for the food to be brought to him. He blessed it and broke the bread, giving thanks to God, reminding all that God is praised, God is the source of all we have. There’s no use in our spinning around in circles if what we do doesn’t begin and end in God and God’s mercy. That’s what Jesus is reminding everyone as he blesses the food. I feel a lot like those disciples sometimes as I look around our parish and neighborhood and notice the hunger. There are a few who hunger physically, and literally. We try to help them, as best we can. When people come to the door of the church, we can help with vouchers or referrals. We take up food for the Capital Area Food Bank, volunteers help with the meals at Christ House over on 18th Street, and for years we have supplemented the meal program at St. Mary’s Court. But there are other kinds of hunger. And I don’t think we’re getting people fed. Our children & families, hunger for various things. Christian formation, other parents going through the same challenges and joys and struggles. The tide of our culture demands that every second be filled with program or skills development, applications, and tryouts. How does the church begin to support a contemporary parent or family or child, but also question the wisdom of the cultural model? How are we to offer spiritual food – the nurture and care so needed—that Christ would bless? A similar hunger happens with the young adults who visit our church. Many come once or twice. I honestly don’t know if they’re just shopping, and once or twice does the trick; or is there something we’re doing that suggests they’re not welcome? Is our way of worship off-putting or too demanding? Or is it just right? Do young adults hunger mostly for other young adults? Or a place to talk about questions, explore problems, and learn to pray or deepen prayer? Increasingly, some of our older adults and becoming much older and are staying at home more. Some are largely confined to home. 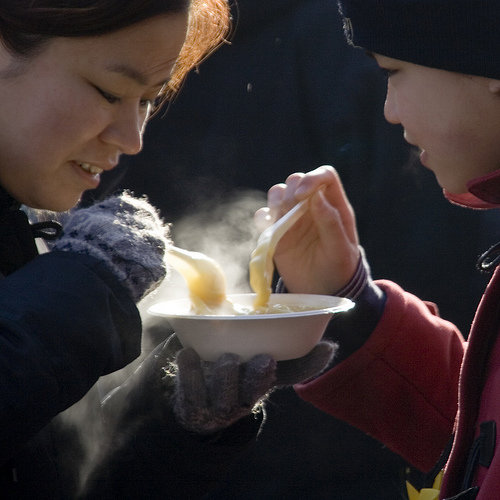 Though they rarely articulate a hunger or need, are we still being the church for them? Are we nurturing in ways that Christ would bless? The same thing goes for some of our parishioners who are not as active. Work gets the best of people. Those who have hoped for a special person in their lives for a long time and perhaps have not found one, sometimes get tired of being in the midst of people who seem all coupled. One way to gather up the various hungers in and around our parish is with the RenewalWorks survey we’ll be asked to take later this fall. I’ve mentioned before the great quotation by Frederick Buechner about vocation, in which he says, “The place God calls you to is the place where your deep gladness and the world’s deep hunger meet.” I have some ideas about what makes me and other “glad,” but in all honesty, I don’t think we yet have an accurate reading on that for which people in and out of All Souls most deeply hunger. But I want us to ask, and listen, and then pray about how we move toward filling the hungry. Sometimes when I don’t know what to do, or it doesn’t seem like the needs can possibly be met, I do say to Jesus, in so many words, “Lord, feed them.” But you can probably guess what I’m hearing Christ say to me (and to you). You feed them. Christ says to us, not in an accusing way, not in a scolding way, but in a way that calls us to deeper faith in him and in ourselves. “You feed them,” he says. Dig into your pockets. Exert some effort. Bring what you find to me and give thanks to God, and guess what—you’ll be able to feed everyone. And there will be enough. Christ doesn’t leave us alone for the ministry ahead. He gives us what we need. But today’s Gospel suggests that perhaps we already have what we need. It’s just a matter of using what we’ve got, which then attracts more, and ends up being just right. faith, our outward sense befriending, makes our inward vision clear. Our inward vision of God, our experience, our hope, all of our faith… is made clear by outward service, by “bending” before others, by helping them, by feeding them, by sharing with them. As we meet our Risen Lord again in the Holy Sacrament of the Altar, my we be strengthened to feed one another with creativity, with purpose, and with God’s good bounty.